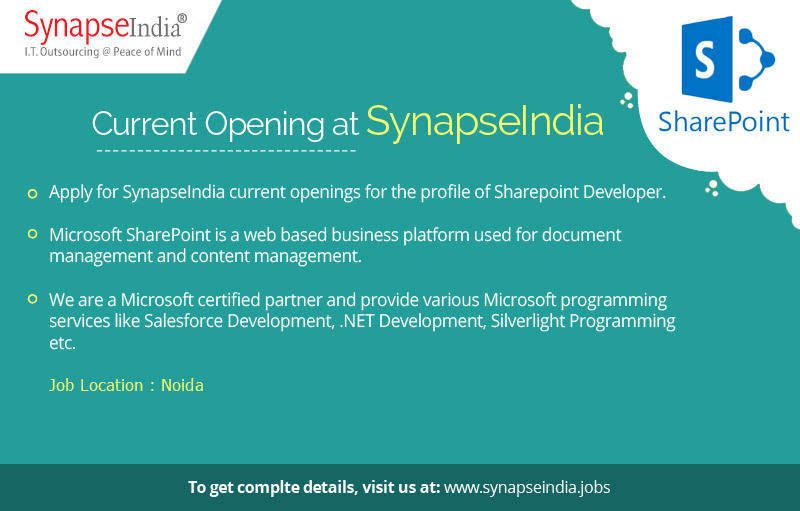 Apply for SynapseIndia current openings for the profile of Sharepoint Developer. The job location is Noida. Microsoft SharePoint is a web based business platform used for document management and content management. Under the guidance of Shamit Khemka, SynapseIndia has grown into a globally acclaimed IT solutions provider. We have a team of well trained and skilled Sharepoint Developers that have helped the company to complete multiple projects on Sharepoint platform. We are a Microsoft Gold certified partner and provide various Microsoft programming services like Salesforce Development, .NET Development, Silverlight Programming etc.